Have you thought about getting a will or a power of attorney but put it off thinking that you have plenty of time? 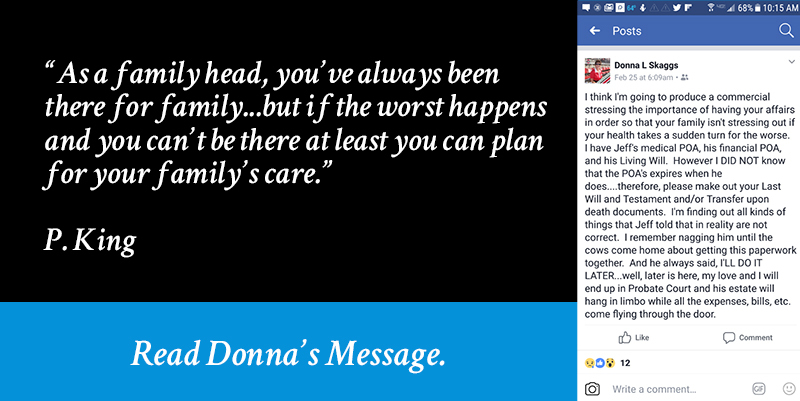 Many of our clients felt the same way – no one plans for accidents to happen. However, accidents happen every day and an unforeseen event can leave you seriously injured or dead. What will your family do then? Estate planning will help you get your house in order before it is too late. Estate planning has two purposes: (1) to preserve your pre-made medical decisions and to ensure that loved ones have the power to make medical and financial decisions for you when you need them to, and (2) to designate the beneficiaries who inherit your estate assets after you are gone and to set up faster ways to transfer your property to your beneficiaries without additional probate court cost and attorney fees. If the answer to any of the following questions is “Yes,” then you need an estate plan NOW. • Do you have child? Is the child a minor? Does the child have special needs? • Do you have a spouse? • Do you own a pet? • Do you own a business? • Do you own a car, motorcycle or boat? • Do you own a registered gun? • Do you have investments or bank accounts? • Do you own other valuables? • Do care about your family and what happens to them when you are gone? The Law Office of Philip A. King, LLC is an Ohio MBE-Certified law office based in Columbus, Ohio. As your Central Ohio Estate Planning Law Office, we can prepare estate planning documents so you don’t have to worry about who will make decisions for you if you can’t or to ensure that your assets are protected after you die. Call 614.610.4545 TODAY before WHAT IF… becomes WHAT NOW! Contains your instructions as to who and how your assets are to be divided. You can even nominate a guardian for your minor children. A Simple Will leaves your property to one person or organization or divides your property in equal or unequal shares amongst individuals/ organizations or a group of individuals/ organizations, for example, your children. Allows you to write down your wishes regarding the medical procedures you want, or do not want to receive if you are in an irreversible coma, have been diag-nosed with a terminal illness, or have suffered from a severe injury and are not expected to fully recover. It also allows you to designate an agent, advocate, or surrogate to speak on your behalf if you are unable to do so yourself. Necessary to designate a person to make medical decision for you if you are determined to be mentally incapable of making medical decisions for yourself. Necessary to dele-gate your financial decisions. There are two types: “durable,” which means that the person you choose will be able to manage your assets and bills immediately and will be able to continue to do so even if you are determined to be mentally incapacitated, and “springing,” which means that the person you choose would not be able to manage your finances until after you have been determined to be mentally incompetent. The Essential 4 for $800 Package includes a Simple Last Will and Testament, a Living Will, and a Healthcare Power of Attorney, and a Financial Power of Attorney. Select the documents and filing options you want from the menu. Call us at 614.610.4545 to order and make a 50% down payment. Complete the Express Services Questionnaire. Review the Completed Documents to ensure accuracy. Sign the final documents and pay the balance. That’s it. Your documents will be processed and ready in days. • Beneficiaries having to wait months or years to receive their inheritance. • Having your current estate plan fail to protect you and your family because it is outdated. Click for information on our next Free Seminar! Get started now! Act now! Why? Because we have found that clients who contacted us immediately, got it done. Don’t wait! Today is not too late, but tomorrow can be. Is your house in order? If not, the Law Office of Philip A. King, LLC can make sure it is. Call the Law Office of Philip A. King, LLC now at (614) 610-4545 to schedule your free 30-minute consultation. “Probate” is the legal process through which a deceased person’s assets (such as bank accounts, vehicles, real property, and investments) are transferred to others. County Probate Courts oversee the process. When a person makes a Will, it controls how his or her assets will be transferred. If a person dies without a Will, the probate law in Ohio will control how the assets will be divided. If there are no living family members, the assets go to the state. + WHY MIGHT I WANT TO LIMIT PROBATE? That’s easy. You want to limit or avoid probate because (1) it can take a long time to administer even simple estates, and (2) it can take money from your savings and other assets – money that would otherwise go directly to your family. It is also worrying for your family—the very people you have always worked so hard to protect and preserve from worry. By investing some time and money to set up these automatic transfers, spouses, parents and grandparents can help their family members avoid or limit probate after they pass away. + WHAT DOES ESTATE PLANNING INVOLVE? 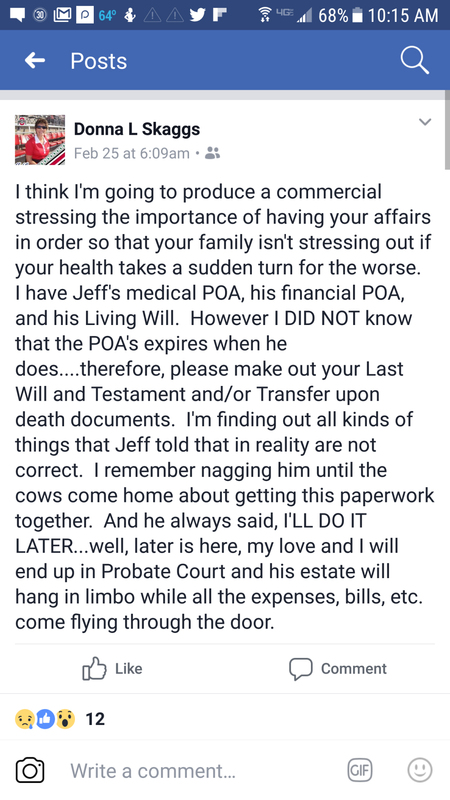 Estate Planning involves both planning for the possibility of mental incapacity, unconsciousness, and for certain death. The following are common documents used for estate planning. If for some reason you become mentally disabled, you will need a two part estate plan in place- one that will take care of your personal decisions and one that takes care of your financial decisions. Otherwise, you and your assets will end up in a court-supervised guardianship or conservatorship. This legal document is necessary to delegate your personal needs and make your medical decisions if you are permanently or temporarily unable to do so yourself. This legal document is necessary to delegate your financial decisions. There are two types: “durable” which means that the person you choose will have immediate ability to take care of your property and will be able to continue to do so even if you are determined to be mentally incapacitated, and “springing” which means that the person you choose will not be able to manage your assets until after you have been determined to be mentally incompetent. This legal document allows you to write down your wishes with regard to what medical procedures you want, or do not want to receive if you are in an irreversible coma, have been diagnosed with a terminal illness, or have suffered from a severe injury and are not expected to fully recover. It also allows you to designate an agent, advocate, or surrogate to speak on your behalf if you are unable to do so yourself. This is also a two part estate plan- one that will ensure all your debts will be paid and one that will determine who will receive the balance of your assets. This legal document contains your instructions as to who and how your assets are to be divided. The biggest drawback is that your property must go through probate before you family will be able to take legal control. This process can take months and in some cases years. Probate being a court-supervised process, is dictated by the probate laws of the state where you lived at the time of your death. This legal document can be used for both mental disability and death. This type of trust will allow you to control your property while you are alive and well, designate the person to manage you and your finances if you become mentally disabled, and then list your instructions as to who gets what upon your death. One of the benefits of using a Revocable Living Trust is that your estate does not have to be probated and your family will be able to gain virtually immediate access your assets upon your death since property held in trust does not have to go through probate court. Another benefit of this type of trust is that you designate yourself as trustee while you are living with a designated successor upon your death. In addition, this type of trust can be changed as things in your life change. An Irrevocable Living Trust can never be changed and should be executed with caution. The document (e.g., deed, vehicle title, insurance policy, bank account) contains a term or provision designating beneficiaries to receive a specific asset at the time of your death without having to go through probate court. It also allows you to specify the percentage of assets each person or entity is to receive. This legal document gives the right of sole ownership to the other person on a joint deed, title or account. Charitable Remainder Unitrust, which would pay you all the income and a percentage of the trust principal on a monthly, bi-monthly, quarterly, or yearly basis. You can chose a percentage from 5-50 percent. The other type of charitable reminder trust is an irrevocable “Charitable Remainder Annuity Trust,” which pays a fixed amount on a monthly, bi-monthly, quarterly, or yearly basis that cannot be changed. It does not matter when you set up the trust because you can add additional property, money or other assets to the trust at any time but you cannot take back assets once they are in the trust. You can even sell property in the trust but the proceeds would go to the trust. You can manage the trust assets (i.e., buy, sell, or reinvest) but the proceeds stay in the trust. + I DON’T HAVE A LOT OF MONEY AND “ESTATE PLANNING” SOUNDS EXPENSIVE. WHY DO I NEED TO HAVE AN ESTATE PLAN? Good question. Estate planning is not just for the rich. No matter who you are, you need what we call the “three essentials” of estate planning – a will, a living will and a healthcare power of attorney. These documents can be combined in our Three Essential Bundle to save you money. If you own a home, a car, or have bank accounts, estate planning allows you to protect and pass more of your assets along to your family. In fact, families with modest incomes and property can benefit as much from estate planning as wealthier families by preserving as many resources as possible for their loved ones. It comes down to this: Would you rather spend a relatively small amount of time and money now to make sure that your family worries as little as possible, and receives as much of your money as possible, after your death? Estate planning allows you to do that. + HOW CAN I AVOID OR LIMIT PROBATE? Ensure that your retirement and other investment income will automatically be paid to your spouse, children, or charity. But it is not enough to simply leave a letter or even a Will saying you want these things to happen. You will need to adhere to the legal processes that Ohio law establishes in order for these transfers to occur automatically. My office can help you make sure you do it according to the law. + WHAT IF I’M SICK FOR A WHILE BEFORE I DIE AND CAN’T MAKE DECISIONS FOR MYSELF? CAN ESTATE PLANNING HELP WITH THAT? Absolutely. You can act now to select family members, friends, or other trusted individuals to assist you if and when you cannot make decisions for yourself. You can prepare a durable power of attorney for health care and a living will to establish the kind of medical care you want. You can also set up a legal power of attorney so that someone else can pay your bills and manage your financial affairs while you are ill. Again, by making those decisions now, you will give your family members the ability to make decisions for you when you can’t without having to get a court-appointed guardian. If you’re ready to discuss an estate plan, call my office at (614) 610-4545 or use this contact form to reach us. When we set up the appointment, our office will tell you what you need to bring to our first meeting in order to get you started. RECEIVE A FREE ESTATE PLANNING OFFER!